Since the iPhone 4 release people having been taking pictures as well as making films on this small handy camera. Adding in small applications such has Instagram and Camera + , that contain various filters and effects, provides you with a a great small portable camera. Plus the ability to upload to all your social networks immediately such as Facebook , Twitter , Flickr. The iPhone 4 has been dominating the web with pictures and films of all sorts. Even I have used to shoot a small short film. Check it out here. The iPhone SLR Mount allows you to Mount your Canon or Nikon lenses to your iPhone to gained manual focus and that coveted shallow depth of field. Although this does seem like a great idea at first… personally I think if you can carry your iPhone and all your SLR lenses, then you must have room for DSLR body. Wowsers…I don’t know if I would invest $250 on this, but I love gadgets. Thanks for sharing! 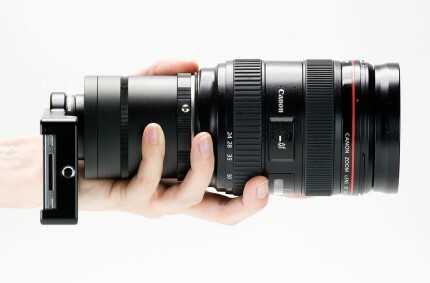 It really is a good idea but I don’t think people buy such a lens just for the iPhone or something like that. @b.nijhoff Agreed. Plus if you already have these lenses, I am pretty sure you would also have a great DSLR body to go with it, that takes far superior pictures. @Tej Babra @b.nijhoff Yes, I agree. the iPhone cannot compete with DSLRs when it comes to photo quality. Better buy a micro 4/3rds.